Choosing to put a loved one into hospice care can be an overwhelming decision. In fact, many caregivers tend to put the decision off, assuming that hospice is a one-way street that will accelerate the dying process of their loved one. This is a persistent misconception. The consequences of delaying hospice care can be significant; a recent study found that patients often wait too long to enter hospice care, thus missing out on the potential meaningful benefits it could offer. Another reason why people tend to hold off on hospice care is because they aren’t exactly sure what it is. Many people believe that hospice is a physical place, when in reality, it usually comprises of medical professionals tending to the patient in their own home. In-home hospice care is an excellent option for people who would prefer to spend the end of their lives at home, surrounded by their family, rather than in the hospital. Hospice care can extend from medical care to include counseling and social services as well. It is focused on palliative care, rather than medical interventions to cure a particular disease. When you and your loved one come to the agreement that is time for hospice care, how do you choose a program that is right for your situation? First, consider location. Because the medical professionals will be traveling to your home, be sure to ask how far away the nurses live from you. If a nurse on call has to travel two hours to reach you, it may not be the best fit. Having a nurse just a few blocks away can help ease a lot of anxiety and pressure. Second, determine what levels of care you or your loved one will need, such as respite care and continuous care. Be sure to ask a few of these key questions when consulting with potential hospice providers. You will likely be able to easily discern how responsive each hospice provider is to your unique needs and be able to select the one that is right for your family. 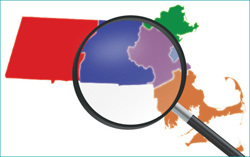 If you are searching for hospice care in Massachusetts and not quite sure where to start, head over to End With Care’s End-Of-Life Care Resource Directory. You can search for hospice providers in your area, and we can help you find the right match.